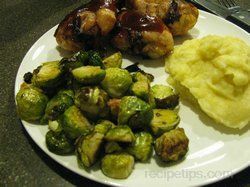 "Roasted brussel sprouts are so good. Roasting brings out the flavors. I've ... read full review"
Heat oven to 400°. In medium bowl combine Brussel sprouts, oil, salt and pepper to taste. Transfer Brussel sprouts and pine nuts to a lightly greased baking pan and roast about 25-30 minutes until fork tender and browned. 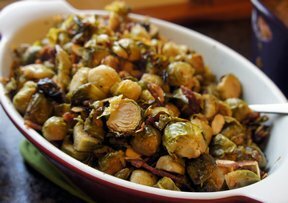 Put sprouts in a serving bowl and drizzle with lemon juice and sprinkle with lemon zest, parsley, capers and additional salt and pepper if desired. Serve hot. 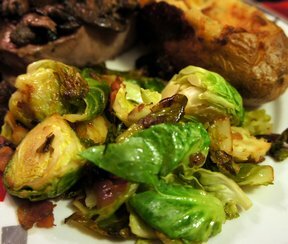 "Roasted brussel sprouts are so good. Roasting brings out the flavors. I've also marinated them in my homemade Italian Dressing, dreined and then roasted in oven for about 30 minutes. Take them out just as they are beginning to brown."